Heat a comal or saute pan over medium heat. Once hot, add the pecans and toast for a couple minutes, flipping a few times. Remove from the heat. When cool enough to handle, coarsely chop and set aside. On the same heated comal or pan, toast the garlic clove in its husk for about 8 to 10 minutes, flipping every once in a while until charred and softened. Then, toast the gaujillo and arbol chiles for about one minute per side, until completely toasted but not burnt. Finally, toast the sesame seeds for a minute or two, stirring, until lightly browned. Break the toasted chiles into pieces, place them into a food processor and pulse until ground. Add the sesame seeds and pulse until finely ground. Add garlic clove, salt, honey, vinegar, lime juice, and olive oil and vegetable oil, and process until smooth. Set aside. In a salad bowl, place the watercress. Pour in some of the vinaigrette and toss to moisten the leaves. 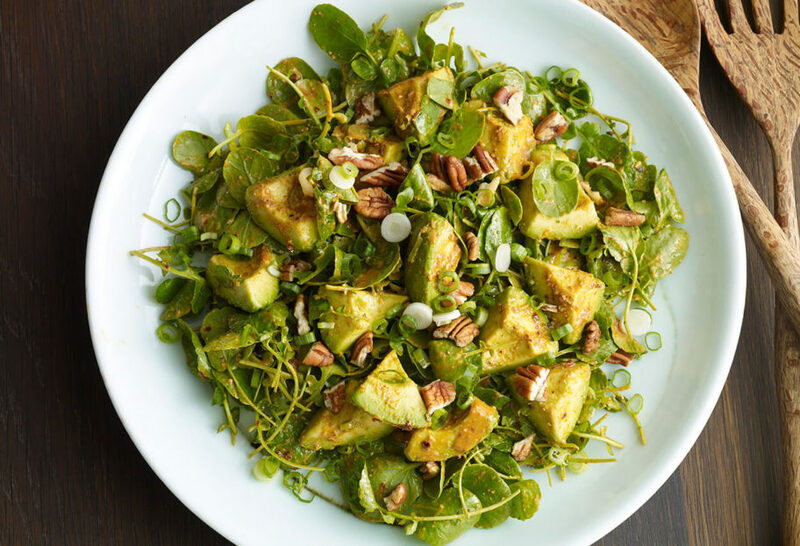 Incorporate the avocados and pecans, drizzle in the rest of the vinaigrette and gently toss. Garnish with the scallions and serve. Made this and loved it. I was out of Pecans, so I used Walnuts and it was just as delish. The dressing is outstanding and could be hearty enough on fish dishes and other proteins. I marinated tofu in it and grilled it… DELISH. Made this for my Parents and they where blown away thanks Pati. Hi. I am unable to find the chilis used in the salad. Is there a more common substitution? Would cayenne or chipotle work? Or some combination? Thank you. I designed the vinaigrette with the combination of these 2 chiles together, and it’s so delicious! You can find them online too, have you tried? If you can only find one of the chiles it would work too, the flavor may change a bit but will still be yummy. Visiting with friends in Tucson. Asked that my wife and I make them something special. We gathered all the ingredients and went to work. Easy to make and Wow! This is special! Gracias Pati! Oh thank you so much, D.! Oh my goodness! Looks delicious! Looks delicious. What could I substitute for the watercress? Arugula? Sure! You can also try baby spinach, baby greens​, or any lettuce you like. Baby spinach would be closest to watercress. I just watched the episode of the show where Pati made this and the sweet potato tamales. Both look amazing and I am going to try them. Does this recipe call for dried or fresh chiles de arbol? Even though I just watched the show, I can’t remember which was used! They are dried…and I hope you enjoy the salad and tamales!